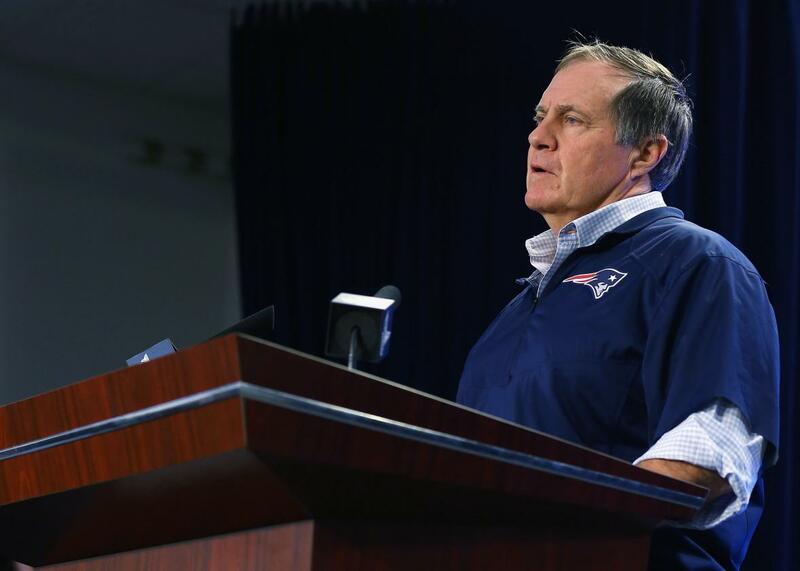 Bill Belichick likes to talk, so long as you ask him these five questions. New England Patriots head coach Bill Belichick talks to the media during a press conference to address the underinflation of footballs used in the AFC Championship Game at Gillette Stadium on Jan. 22, 2015, in Foxboro, Massachusetts. This terse coach-speak fits the popular image of Belichick as a gruff stonewaller, resistant to all efforts to unearth his inner thoughts. But there’s little truth to the widespread belief that Belichick hates gabbing with reporters. If you ask the right question, the supposedly laconic Patriots mastermind will talk and talk and talk some more, going on at such great length that he’ll feel compelled to apologize for giving such a thorough answer. To understand which topics incite the coaching legend’s logorrheic tendencies, we created a script to crawl Patriots.com’s storehouse of Belichick transcripts. We found 969 events dating back to May 2007—press conferences, conference calls, etc.—in which Belichick took questions from the media. After sifting through that vast corpus of questions and answers, we uncovered the coach’s 100 longest soliloquies, all of which run past 500 words. On the other end, we found 49 instances in which Belichick refused to dignify a reporter’s question with more than a single word. They are a joy to behold. So, what is the secret to drawing out Bill Belichick? If you want the coach to open up, you should follow one of these six plans of attack. It’s not just the 60 protection that gets Belichick revved up. Back in October, after a raging one-day controversy over the league’s “illegal bat” rule, the coach offered an 819-word overview of how he teaches players the NFL rulebook. “I talk to the team on a regular basis on situational plays, which involve officiating, timing, utilization of timeouts and so forth and so on,” he said. “And of course once you get into the kicking game, you can multiply everything that happens on offense and defense exponentially”—I’m going to cut off the quote there, because he spent a very long time describing various scenarios that can happen in the kicking game. 3. Ask Him About the Kicking Game. Belichick got even more excited when asked this November about a hypothetical expansion of NFL rosters, a query that elicited his third-longest press conference answer ever: 926 words. “I think one of the issues with the extra players, if you will—like going from 46 to some higher number on game day—it gets into the over-specialization,” Belichick said, conveniently steering the conversation toward the kicking game. “Do you have a long field goal kicker, a short field goal kicker, a kickoff guy, a field goal kicker, extra specialty-type players that therefore just require other extra specialty-type players?” This time, he didn’t mention Gino Cappelletti. A year ago, the Patriots stood accused of the crime of deflating footballs. On Jan. 24, 2015, Belichick defended his team’s honor in a wide-ranging 14-minute speech that began, “I want to take the time to share some information.” Belichick explained the team’s ball-preparation techniques in so much detail that you’d have thought someone asked him about Gino Cappelletti. (“I’ve handled dozens of footballs over the past week,” he said.) He also discussed how “air pressure is a function of the atmospheric conditions,” though he did acknowledge that he is not the “Mona Lisa Vito of the football world.” Although it’s possible to make certain inferences from that remark, as of publication time it is not clear how Belichick would respond to a direct question about the film My Cousin Vinny. Just as there are ways to get Belichick to blab, there are topics you must avoid. Here are three things that you should not ask the Patriots coach if you want him to keep his lips moving. “I know you talked in a conference call about utilizing players at this time of the year when the division is already wrapped up. Could you elaborate on that?” a reporter asked in December. “No,” Belichick said. Question: Where is Shaun [Ellis] in terms of his readiness? Question: Is it about the same as Albert Haynesworth? Question: Albert has had knee issues and Shaun has had hip issues. Do you care to illuminate us on if that’s what they’re dealing with? Thanks to Lakshmi Varanasi for research assistance.